Sometimes you open a package of ramen and you know it's going to be a winner. Other times you open a package of ramen and you know it's going to be a dud. And then, there are those rare surprises when you think it's a dud but it ends up being a winner. Paldo Korean Broad Noodle is one of those rare surprises. It weighs in as the biggest ramen yet, 123 grams, but it's worth every bite. The noodles come with a single flavoring packet, which looks like a slimy brown liquid roughly resembling soy sauce. The package did not identify a specific flavor like beef or seafood. So with low expectations, I squeezed out the liquid into the noodles and set it aside while I prepared the egg and vegetables, assuming it would be some generic weak soy sauce flavor. Lo and behold, a few minutes later I turned back and the brown gunk had become a flavorful red broth with little hot oil bubbles around the edges! Better yet, the taste of the ramen blew me away. 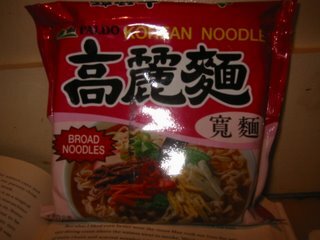 While calling the noodles "broad" is a bit of an overstatement, they are slightly bigger than typical ramen noodles and have a nice heft and chewy texture. They also absorbed the aroma of the broth, which itself was slightly spicy, garlicky, and unique. 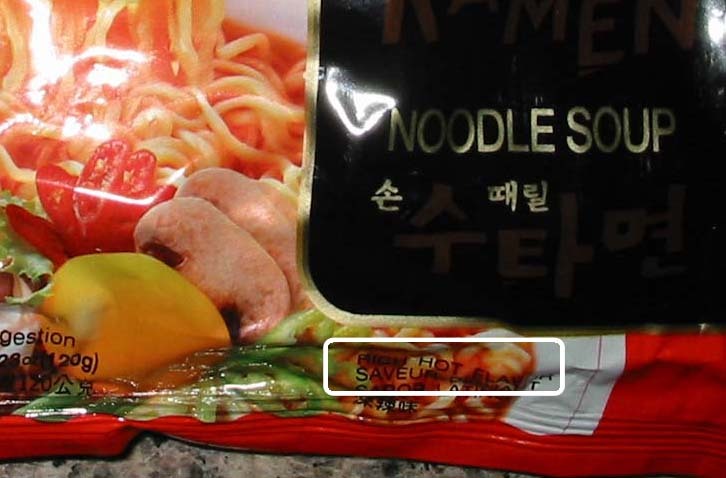 The ingredient list identifies the unique taste as a "red pepper sauce," something not often found in instant ramen. The taste was intense but not overwhelming, spicy but not inedible (like certain other Korean ramens). I usually don't drink most of the broth in ramen because of the sodium and preservatives. But this time, it was "good till the last drop!" 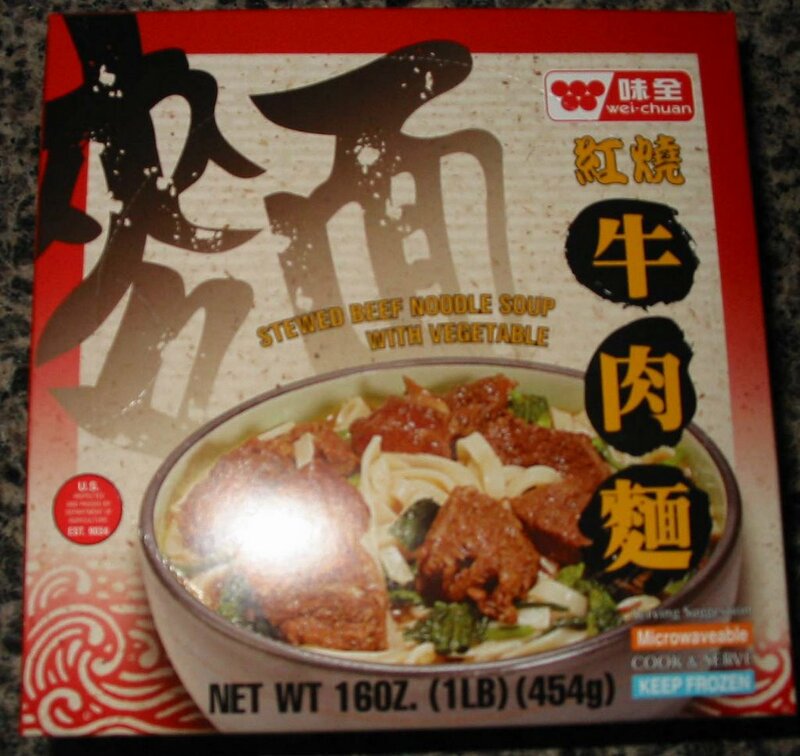 Six Fortune Instant Beef Noodle - Stay Away! Six Fortune Instant Beef Noodle is a 120g Korean ramen that comes with two packets - a veggie packet and a seasoning packet. If you couldn't tell from the title of this post, this was one of the worst ramens I have ever eaten and one of the few I have actually regretted eating later. 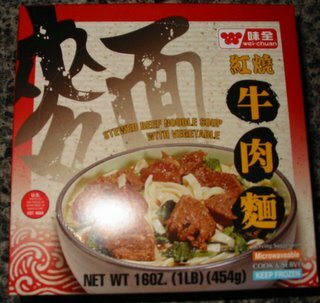 The broth tasted extremely bland and nothing at all like beef. 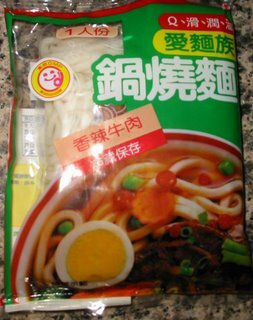 The veggie packet had scallion flakes and these weird spongy brown things, which I had no idea what they were but added nothing to the overall ramen experience. The noodle texture was too stiff, not chewy, and did not absorb what little flavor was in the soup. In summary, avoid eating this ramen! This Ramen Lover has been in Virginia all week. Although the DC area has very few ramen restaurants, we found out that Blue Ocean has it! Their menu is mostly a traditional Japanese restaurant menu - sushi, sashimi, and rice dishes. They also had a wide variety of udon and soba noodles. There is only one type of ramen, and it was not described in the menu at all, so I was a bit hesitant about ordering it, but I wasn't about to pass up a chance at ramen! The ramen arrived and I was immediately impressed with the presentation. It was essentially a shoyu (soy sauce) ramen with the thin yellow noodles, topped with a slice of roast pork, a fish cake, fresh scallions, half a boiled egg, nori, and fresh bamboo. The toppings were arranged artfully on top of the soup. The taste did not disappoint - the yellow noodles were the perfect texture to accompany the broth and were of a wonderful consistency, chewy and sleek. The broth was fragrant yet light. Overall, the combination of ingredients somehow melded together beautifully and the ramen was truly a delight to eat! 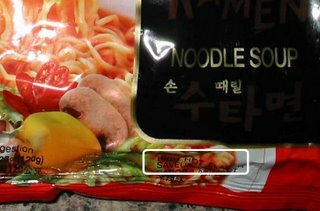 Paldo Korean Noodle - Chicken Flavor is a 120g Korean ramen, shaped in a rectangle, that comes with two packets. One contains vegetables (green onion and dried thin tofu squares) and the other is a spice packet. I did not really like this ramen. The broth flavor tasted pretty much like chicken broth - no special fragrances or tastiness. The noodles also did not soften as much as I would like and I'm not sure whether it absorbed much soup flavor, since the soup was so bland anyway. I would not recommend this ramen for eating again. I think I was initially drawn to this packet of ramen by the similiarity of its name to the popular Sudoku puzzles. But the similarities stop soon after. 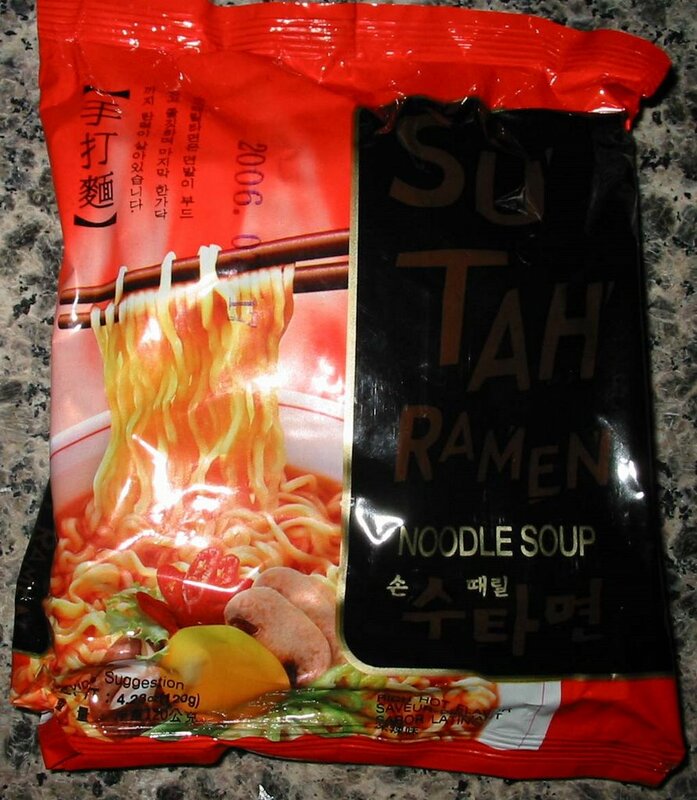 For one thing, Sudokus are popular number puzzles and Su Tah Ramen is a noodle soup. 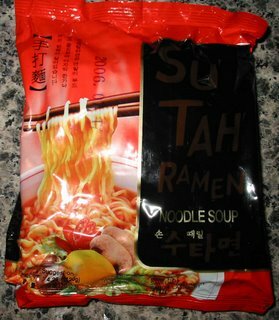 These are a hefty 120g, much like other Korean noodles such as the popular Nong Shim line. No such luck in getting a circular block, though. 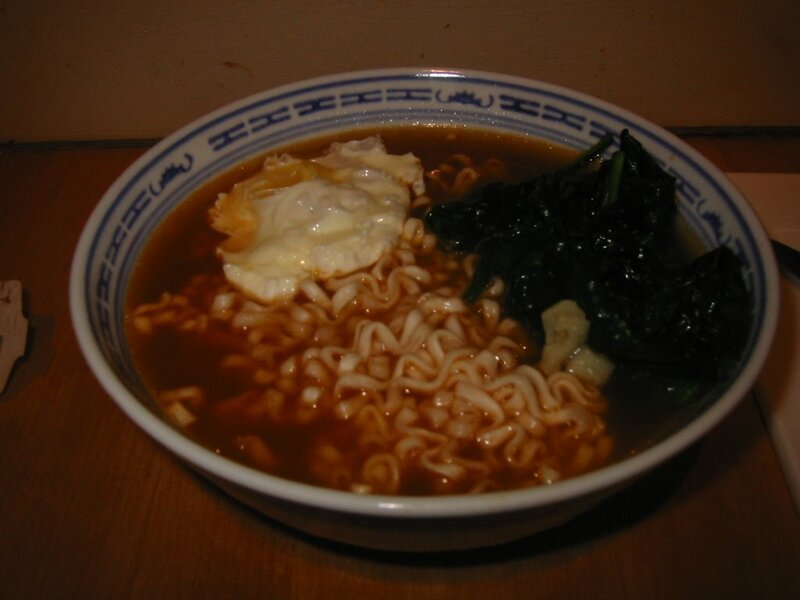 The ramen was as square as a wheel in The Flintstones. Upon eating the noodles, I was in for a shock. These were quite hot and spicy! Turns out the packaging had written in tiny print, "Rich Hot Flavor". I've highlighted it in the picture below so you can see just how hidden this was! This ramen reminded me very much of Nong Shim, especially their Shin Ramyun. In a blind taste test, I would be hard pressed to tell the difference. I think the Shin Ramyun Hot & Spicy is still spicier though. Still, a comparison to Shin Ramyun is high praise and I was quite satisfied with these noodles. Sapporo Ramen, located in the food court at the Porter Exchange Building, has three types of broths - soy sauce, miso, and clear. Since I have never had the clear (salty) flavor there before, I decided to try the clear moyashi over the weekend. The moyashi comes with ground park and heaps of Chinese vegetables, including bean sprouts and Chinese broccoli, for around $8. Overall, I found the flavor to be fairly bland and in most respects inferior to the soy sauce and miso broths. 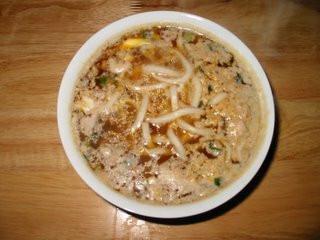 One positive point to the clear flavor is that since it is so light, one is able to taste the flavors of pork and vegetable in the soup when you are drinking it, as opposed to an overwhelming soy sauce or miso taste. The noodles, meat, and vegetables were standard - I especially like the generous portions of vegetables that come with the moyashi selection. The serving size is large enough to comfortably feed two people for lunch. In summary, a nice ramen, but only if you are looking for a light subtle flavor. 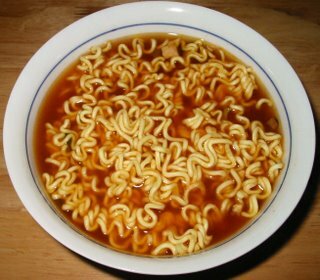 These noodles are in a different class than most of the noodles reviewed on this website, but I thought I'd include it anyway. Unlike most other instant noodles, no water needs to be added to this. Instead, it comes in a plastic bowl with beef and vegetables already included. The bowl needs to be kept frozen. I am quite familiar with some of Wei-Chuan's products, especially their pickled cucumbers and dried noodles, and have been pleased with their quality in the past. 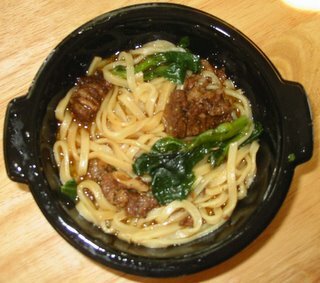 This noodle bowl is very convenient because all you have to do is pop it in the microwave and it's soon ready to eat. As you can tell by this picture, the noodle soup came out looking delicious. The meat was soft and surprisingly fatty. I would have expected leaner cuts, but the fatty cuts were definitely delicious. The noodles were quite good, definitely tastier and more substantial than the kind found in dried instand noodles. All in all, I would be perfectly satisfied if I received this in a restaurant. Of course, I have had better, but this is by no means inferior to the typical beef noodle soup served in a decent Chinese restaurant. The portion size is quite small compared to what you would normally get in a restaurant. Also, the addition of some scallions would have been nice. However, I was pleasantly surprised by these noodles and would definitely get them again...if there weren't already a decent Chinese restaurant across the street! These noodles are the first instant noodles that I have ever had that aren't dried. They can be found in the refrigerated section of Asian grocery stores. This specific brand is imported from Taiwan. Don't panic! That cloudy stuff on the top of the soup is from the egg that I added. Following the instructions, I added 500cc of water, which turned out to be way too much. So much so that it diluted the taste of the soup. Perhaps they were expecting more water to boil off, especially since the microwave instructions only call for 350cc of water. Well, it was hard to figure out what this was supposed to taste like since everything was too dilute. 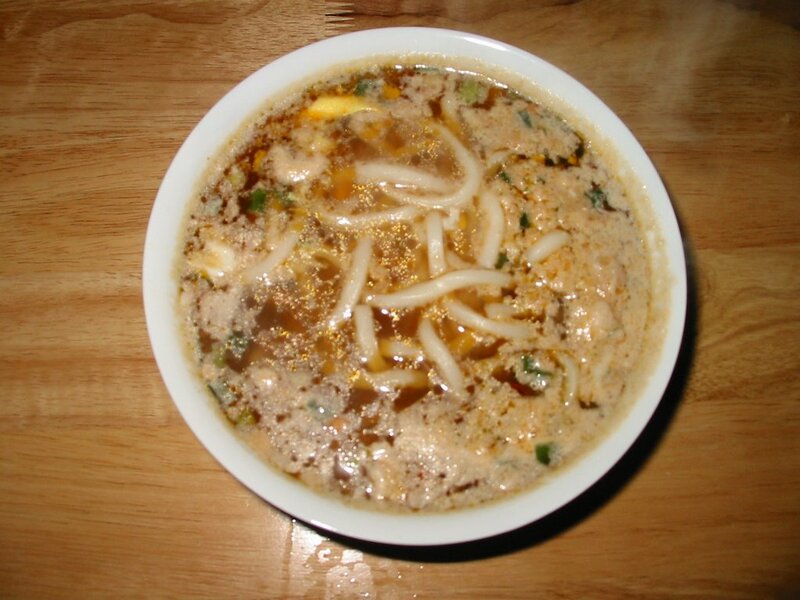 The noodles were nicely thick and chewy, but didn't have much flavor since there wasn't much to absorb from the soup. Interestingly, the scallions were extremely potent, unlike the tasteless filler that they usually put in instant noodles. Next time, I'll be sure to add only about 350cc of water when making this on the stove!